Missing tire caps result in leaking valve cores, compromising safety, performance, tire wear & fuel mileage. Capsure TM Tethered Tire Caps are the finest tire caps designed so you won�t lose them again. 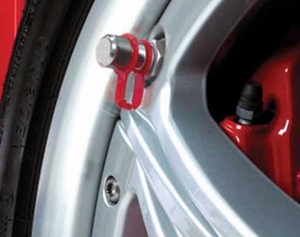 They are precision machined 303 STAINLESS STEEL CAPS and have durable yet flexible KEVLAR� REINFORCED TETHERS that stay attached to the tire stems while airing your tires. The caps are available in a SLEEK MACHINED FINISH and a BRIGHT POLISHED FINISH. The UV Protected tethers are available in Red. Truly engineered to stand in a class of their own, the Capsure TM Caps have a patented coating to help avoid corrosion and seizing. Capsure TM Tethered Tire Caps install in seconds, look superb, and add that perfect accent of detail to style with virtually any wheel. You get 4 Tire Tethers of your color choice (Select Below). Precision Machined & Anti-Seize/Corrosion treated, these gorgeous caps withstand rigorous conditions & feature vertical knurls for a sure grip. Durable yet flexible tethers feature Kevlar® for added strength, ensuring that your caps are always attached to your stems. UV protected & available in many colors including black, clear, red, blue, silver, white and yellow. Provides the final seal to reduce air leaks from tire valve cores.